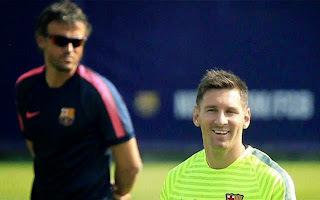 According to reports, the spat between Barca playmaker, Lionel Messi and coach Luis Enrique is yet to be resolved. The feud started after the Blaugrana’s loss to Real Sociedad several weeks back. The Argentine attacker was so angry with the coach for introducing him at half time that he refused to turn up for training the following da‎y. Barca’s heavy defeat to Malaga during the weekend seems to have worsened matters. Spanish newspaper reports that Enrique hasn’t spoken to his players after it. His relationship with Messi hasn’t been better as both parties have reportedly not spoken to each other for 7 weeks. “It is a fact that the Barcelona manager is not very keen on talking to his players after a match, but the Málaga game was out of the ordinary. And as he did not speak with the players, he did not speak to Leo Messi, as in any case they have not spoken for some time. In fact, not since the defeat against Real Sociedad at Anoeta when they became estranged. Since then their relationship has been non-existent. The situation has been helped by a run of good results, but now Barcelona have lost again it remains to be seen what will happen.